THIS CAR IS A TRUE TIME CAPSULE. ALL ORIGINAL WITH UPDATED TIRES AND BATTERY. RUNS AND DRIVERS GREAT. BODY HAS A FEW MINOR SCUFFS AND SCRATCHES BUT THE CAR IS ALL ORIGINAL AND WE WANTED TO PRESERVE THE ORIGINALITY. THESE ARE VERY LIGHT AND QUICK VEHICLES. THE MOONROOF SEALS DO LEAK LIKE MOST OF THEM INSTALLED IN THE 80'S. THE UNIQUE MID-ENGINE DESIGN MAKES THIS CAR A VERY UNIQUE PART OF PONTIAC HISTORY. 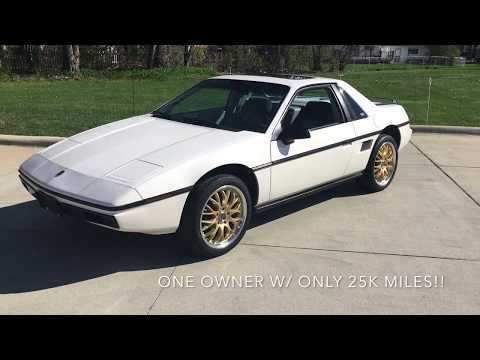 The Pontiac Fiero is a mid-engined sports car built by Pontiac from 1983 to 1988. The Fiero was designed by George Milidrag and Hulki Aldikacti as a sports car. The Fiero was the first two-seater Pontiac since the 1926 to 1938 coupes, and also the first and only mass-produced mid-engine sports car by a U.S. manufacturer. Many technologies incorporated in the Fiero design such as plastic body panels were radical for their time. Other features included hidden headlamps and, initially, integrated stereo speakers within the driver and passenger headrests. Call Dave at Showdown Motors 586-662-0913. *Watching doesn't buy a nice car like this..bid with confidence or call to make offers! Vehicle is for sale locally and auction may end at any time without notice to ebay. We do encourage all bidders to call before bidding to answer any questions and check availability. If you need the vehicle shipped please call for rates. All vehicles must be paid in full before shipping. Vehicle is sold as-is. We encourage that buyers inspect vehicle or arrange appraiser to come to our dealership and inspect vehicle. Michigan residents to pay 6% sales tax or anyone planning on driving this vehicle home where they cannot present a bill of laden. In those cases when registering the vehicle in your state you will receive a credit from what was paid at time of purchase. We only accept paypal for deposit due to paypal fees. OVER 90% of our ebay sales are not completed online so please call to discuss if you are a serious buyer. $95 Documentation fee on all purchases. CALL DAVE IF YOU WANT TO NEGOTIATE A BUY IT NOW PRICE- 586-662-0913 CELL. We do not give any BUY IT NOW prices by email, but you can email or call with your questions on the vehicle or for a shipping quote. Don't get fooled by low bids, the real buyers are calling and making offers. We sell 70% of our vehicles before the auction ends.. SO PLEASE CALL FOR FULL DESCRIPTION. All shipping charges are buyer's responsibility. SUPERSPORT AUTO AND SHOWDOWN MOTORSwill help with shipping arrangements but will not be responsible in any way for claims arising from shipping damage! Licensed Carriers are generally insured for $3,000,000.00. We assume no responsibility for damages incurred after the vehicle leaves our showroom. All shipping arrangements are provided by SUPERSPORT AUTO AND SHOWDOWN MOTORS as a courtesy. We are not affiliated with any carrier. Any claims or other communication regarding shipment of vehicles will be between you and the shipper, not with SUPERSPORT AUTO AND SHOWDOWN MOTORS. Buyers Inspection: SUPERSPORT AUTO has done our best to disclose all information known about this vehicle for auction. SUPERSPORT AUTO AND SHOWDOWN MOTORS welcomes a buyers inspection. If you plan to have a buyers inspection, please make sure you inspect the vehicle prior to the auction ending. Inspection fees if any are Buyers responsibility. Representations and Warranties made by seller:This vehicle is being sold “as is”. Manufacturers warranties may still apply. Extended warranty may be available. No representations or warranties are made by seller, nor are any representations or warranties relied upon by bidders in making bids.